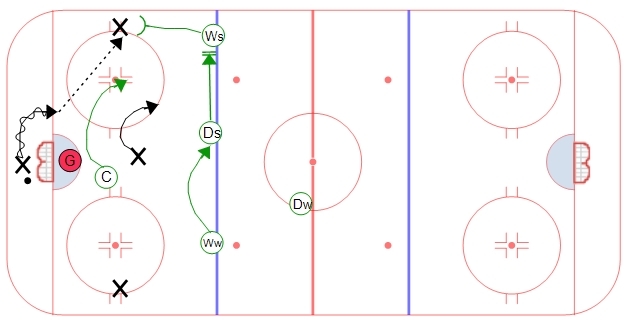 NE 1-3-1 forecheck | Ice Hockey Systems Inc. This is a 1-3-1 variation that is similar to a typical trap forecheck. This is often very useful against a control breakout or a line change situation when you cannot pressure the puck right away. The center's (F1) objective is to steer the direction of the opponent's breakout to one side. As the pass is made to the wall the center continues to angle the puck and take away a pass back to the defense or up through the middle of the ice. The strong side wind (Ws) anticipates the first breakout pass and puts pressure on the winger with a goal to create a turnover. The strong side D (Ds) moves to the wall to seal the wall. The weak side wing (Ww) moves into the high slot area to stay on top of any pass made to the middle. If the puck makes it into the neutral zone on the strong side then the weak side wing is responsible for retrieving it. The weak side defense (Dw) controls the weak side of the ice. They need to make sure that they keep any opponent in front of them on the weak half of the ice. Looking for additional hockey forechecking systems? View more hockey forechecks.